For 102 days we held the line against Wall Street’s attack on the American worker. We held the line for our families, who deserve good quality jobs and healthcare. We held the line against a billionaire taking from us to line his own pockets. We held the line for our community, because we are proud of the middle class standard we have fought for in Atlantic City. We are 18 different languages and nationalities united in one voice: Enough is Enough. We stand up for good jobs, with dignity and respect. And we will not let a Wall Street billionaire take that away. We held the line, and we will be back. /wp-content/uploads/2016/06/uniteherelocal54.png 0 0 Diana Hussein /wp-content/uploads/2016/06/uniteherelocal54.png Diana Hussein2016-10-10 09:55:282018-01-12 12:54:53Trump Taj Mahal Workers: We held the line. (Atlantic City, NJ)—UNITE HERE Local 54 and its President Bob McDevitt today urged State Senator Steve Sweeney to enter the race for Governor. “Senator Sweeney has been a steadfast advocate for the working people of Atlantic City and the rest of the State of New Jersey. He has consistently advanced commonsense solutions to the problems facing our state. Senator Sweeney believes every worker deserves a living wage, and he has proven time and again that he is unafraid to take on powerful interests to fight for a brighter future for New Jersey’s working families. He also has a good plan for school funding and is committed to making New Jersey colleges strong and affordable. The middle class in New Jersey needs a champion in the Governor’s office, and Steve Sweeney is the leader who has demonstrated the grit and determination to be that champion, and to make a real difference in the lives of working families throughout the state,” said Bob McDevitt, President of Local 54. Representing 10,000 men and women, UNITE HERE Local 54 is the largest casino workers union in the state of New Jersey. /wp-content/uploads/2016/06/uniteherelocal54.png 0 0 Diana Hussein /wp-content/uploads/2016/06/uniteherelocal54.png Diana Hussein2016-09-06 02:43:252016-09-06 02:43:25PHOTOS: Global Solidarity for Trump Taj Mahal Strikers! (Atlantic City, NJ)—At negotiations today, workers at the Trump Taj Mahal made a contract proposal that would resolve the ongoing labor dispute at the Trump Taj Mahal. The union proposal costs only $1.3 million more over the next year than the company’s last proposal that was rejected by the workers on June 30. “We came up with a proposal that will restore what we have lost while at the same time giving the company time to rebuild its business. This is a win-win proposal in my book,” said Peter Battaglini, a 26-year bellman. And, Trump Taj Mahal would agree to implement the Tropicana contract beginning on September 1, 2017. “This labor dispute has been going on for almost two years. The company has saved about $25 million in labor expenses, but lost between $150 and $200 million in revenues. The proposal we put forward today allows all of us to move forward. Now it’s time to see if this company is interested in moving forward or just wants to punish workers and Atlantic City,” said Bob McDevitt, President of UNITE HERE Local 54. A recent analysis of revenues at the Trump Taj Mahal shows that the company lost out on at least $150 million in revenues over the course of the labor dispute. The report is available at http://bit.ly/tajreport. One thousand cooks, housekeepers, bellmen, bartenders, cocktail servers, and other service workers from the Trump Taj Mahal have been on strike since July 1. Many workers at the Trump Taj Mahal, including those with years on the job, have seen only $.80 in total raises over the last twelve years. The cost of living in Atlantic City has risen over 25 percent in the same time period. Housekeepers, servers and other casino workers at the Taj Mahal earn an average of less than $12/ hour. As the sole debt-holder between 2010 and 2014, Icahn extracted $350 million from the property, driving it into bankruptcy and then swooping in to take control. He used the bankruptcy proceeding to strip Taj Mahal workers of health benefits, retirement security and even paid breaks. Overall, he cut worker compensation in wages and benefits by 35%. /wp-content/uploads/2016/06/uniteherelocal54.png 0 0 Diana Hussein /wp-content/uploads/2016/06/uniteherelocal54.png Diana Hussein2016-08-29 16:43:382016-08-29 16:43:38PRESS RELEASE: Casino workers to Icahn: "Our proposal simply $1.3 million different than yours. We can end this dispute today." In October 2014, Carl Icahn, the current owner of the Trump Taj Mahal and the Tropicana, did something at the Trump Taj Mahal that no other casino employer in the modern history of Atlantic City had done—he eliminated health insurance and other benefits for around 1,000 cooks, housekeepers, bartenders, cocktail servers, and other service workers. Icahn’s unprecedented actions provoked a labor dispute between the casino workers and the billionaire. In the first quarter of the labor dispute, hotel occupancy DROPPED by 12 percentage points even as the industry INCREASED occupancy by 5 percentage points. The drop in occupancy continued through the present quarter. One way to measure the Trump Taj Mahal’s performance relative to the rest of the industry is by comparing RevPAR (Revenue Per Available Room). In the first half of 2014, the Trump Taj Mahal had RevPAR of almost 60% of the rest of the industry average. In the final three months of 2014, the wheels came off as the Trump Taj Mahal’s RevPAR fell to just 40% of the rest of the industry average, a point from which it has not recovered. If Icahn had not picked a fight with the casino workers, and the Trump Taj Mahal’s RevPAR had remained at 60% of the industry average, it would have translated to about an additional $20 million EACH QUARTER in revenue. In total, between October 2014 and the end of June 2016, the Taj Mahal lost out on over $150 million in revenue. If instead of fighting his employees, Icahn had reinvested in the casino and, starting in the third quarter of 2015, Taj had been able to INCREASE its RevPAR relative to the rest of the industry to75%, it would have meant an additional $65 million in revenue for the Taj Mahal or a total of $215 million. Icahn has chosen to wage a 22-month battle with 1,000 employees that has cost the Taj Mahal an estimated $150 million when the conflict could have been resolved for a few million dollars a year. It is fair to ask whether this is a business decision or if one of the richest men in the world has some axe to grind with employees that make an average of less than $12 per hour. (Atlantic City, NJ) — Union members at the Trump Taj Mahal announced the creation of a GoFundMe campaign for the Local 54 Hardship Fund. The funds will be used to provide assistance to workers hit hard by Carl Icahn’s destruction of good jobs at the casino. “Workers have been struggling under Carl Icahn’s reign of terror at the Trump Taj Mahal for over 22 months. Their benefits have been stripped away, and now, Icahn has said that he will close the place in 2 months. These women and men have been on strike for over a month to defend middle class jobs. People ask all the time how they can support the strikers; this GoFundMe campaign is one way to do that,” said Donna Decaprio, Financial Secretary-Treasurer of UNITE HERE Local 54. In October 2014, Donald Trump supporter, Carl Icahn, used the bankruptcy process to strip 1,000 workers of their health insurance, pensions, paid lunch breaks and increase the workload for some. On average, the workers total compensation has been cut by more than 30%. As a consequence of Icahn’s cuts, about one-third have no health insurance while another 50% rely on some form taxpayer subsidized insurance. A portion of the 1,000 workers rely on other government programs, like food stamps. 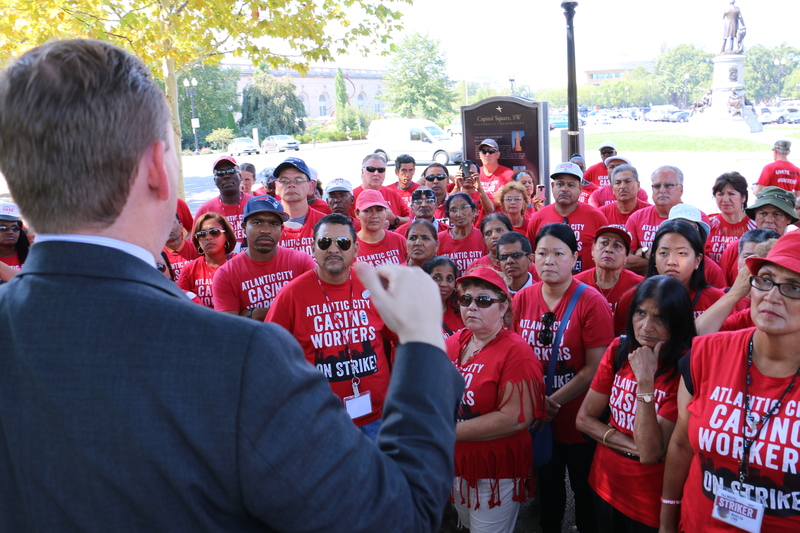 On July 1, 2016, Trump Taj Mahal workers took a stand against Carl Icahn’s policies and went on strike for the same contract that other Atlantic City casino workers have. Icahn was intimately involved in the decision to strip workers of their benefits. According to documents filed with the bankruptcy court, Icahn and the then-management of the Trump Taj Mahal began working together on a strategy to reject Local 54 contract over a month before the company filed for bankruptcy. The Unite Here Local 54 Hardship Fund assists strikers who are experiencing financial difficulties with paying rent, mortgage, utility payments, medical bills and other essential expenses. Donations will assist strikers who are experiencing financial difficulties. Donations from employers are not permitted and donations are not tax deductible. All donations will be handled in accordance with applicable state and federal laws.